This beautiful hardback features premium cloth binding, a ribbon marker to match the cover, foil stamping and illustrated endpapers, making this the perfect gift for all those who have been enchanted by the magic of Dumbo and a book to be treasured by all. 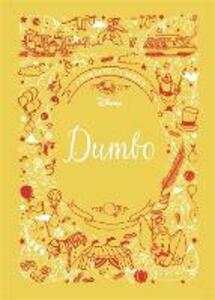 A family favourite for almost eighty years, Disney Dumbo is one of the best-loved films of all time. Relive the magic through this retelling of the classic animated film, accompanied by paintings, story sketches and concept art from the original Disney Studio artists. Also featured is a foreword by Natalie Nourigat, a storyboard artist at the Walt Disney Animation Studios. Turn to the back of the book to learn more about the artists who worked on this iconic animated film.